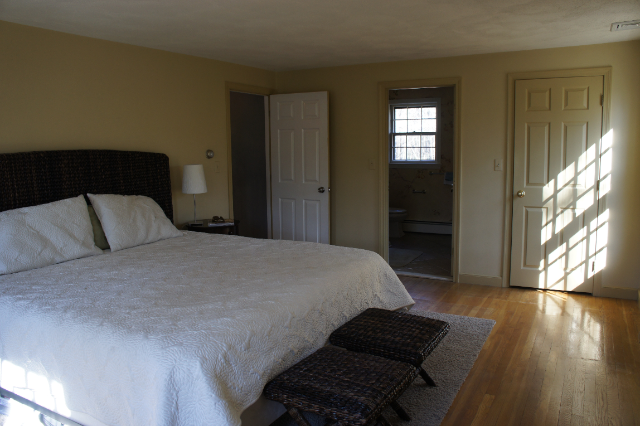 The master bedroom is finally, officially, 90% done. In my book that means it's DONE. Back in May, I shared some preview photos in this post. I was waiting for Jake to help me hang curtains before I shared the whole shebang with you. But then we went to Israel, bought a new washer, dryer, and dishwasher, visited my family in Maine, and starting enjoying the warm weather. Jake hung the curtains for me last Saturday but then I had to, ya know, umm, clean. A lot. So it's just today that the room is somewhat presentable for me to snap pictures. I don't get the best lighting in there this time of day, so bare with me. I know I should wait and take pictures later today, but by then the room will be a mess again, and the dog will be curled up on the bed, and I just don't have that kind of energy to clean the same room twice in one day. What can I say? Let's get on with the program. This is the first room I "finished" in the house (all the other rooms are in some stage of redecorating) and it feels so nice to have it done. All in all, I'm pleased with how everything came together. 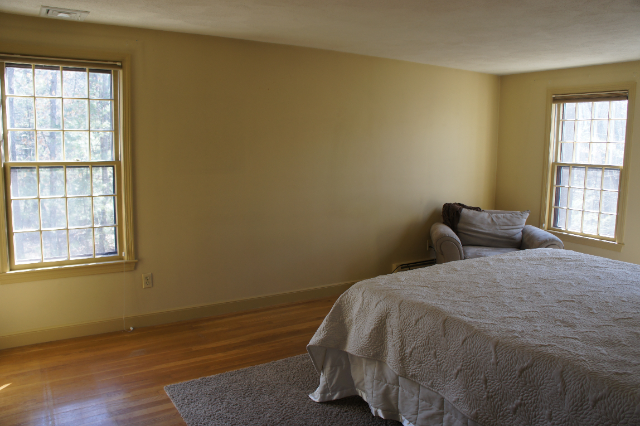 I'd like to find a leaning mirror and maybe swap out the sunburst mirror above the bed for something larger and more to scale. I'd also like to add a floor lamp near the reading chair and hang more photos. The paint color is bold (well for me it's bold:)), but so far we both like it. Come winter, I might decide to soften the color a bit, but it's great for this warm summer weather. 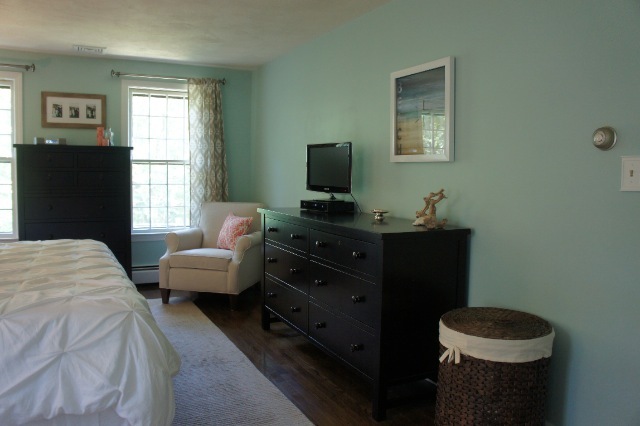 I wanted to create a bedroom retreat that felt a little "beachy" but I didn't want it to be too obvious. 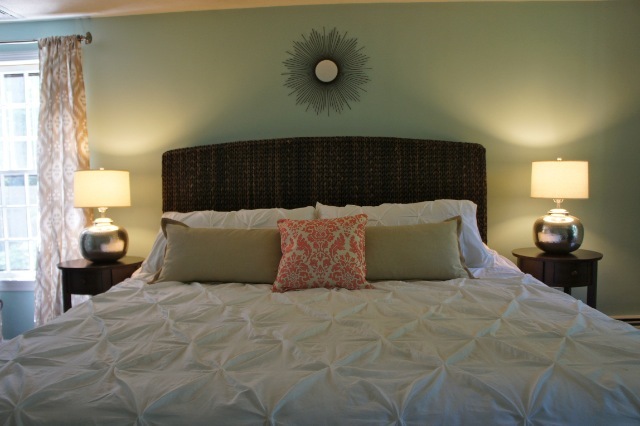 We started with the Seagrass headboard and stools from Pottery Barn. Jake requested that we go with the darker mahogany color instead of the honey color, so I obliged. I'm happy with the choice because I think it can carry us through many different styles. I selected a jute-like woven rug, but it's actually really soft and nice on the feet which is important in a bedroom. 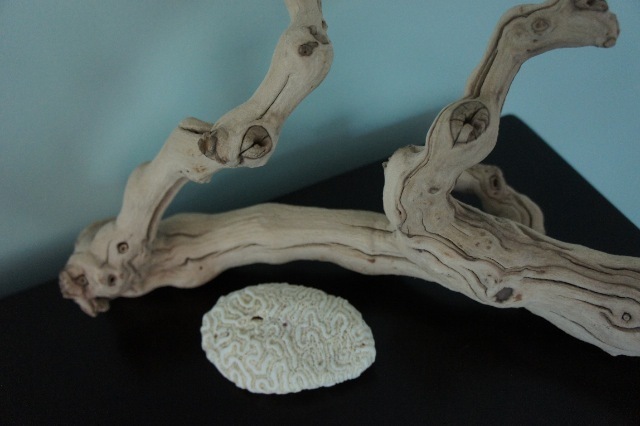 I accessorized with some driftwood and seashells. 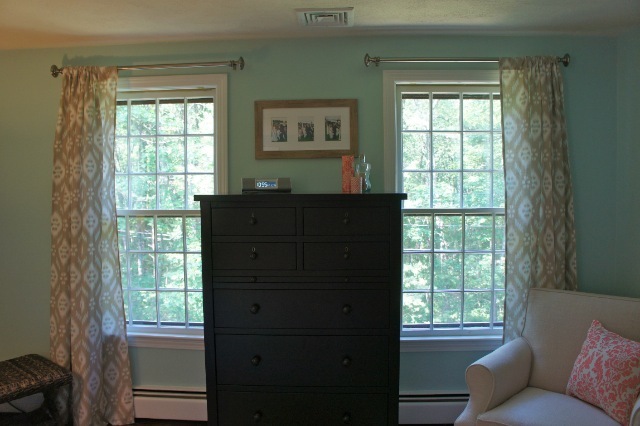 The curtains have an Ikat print that add a little pattern and interest to the space. 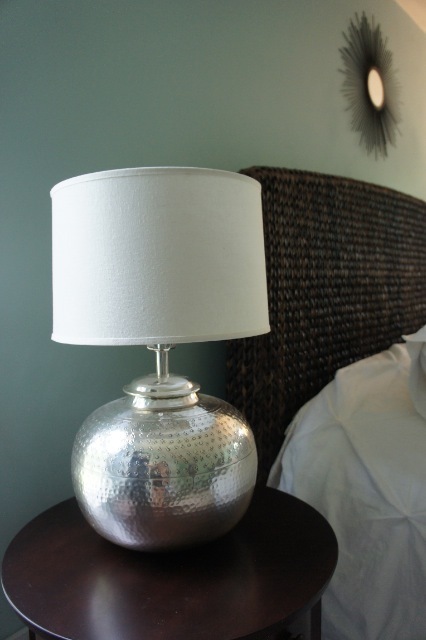 The lamps are from Pottery Barn and add a bit of shine and shimmer against the more rugged seagrass. 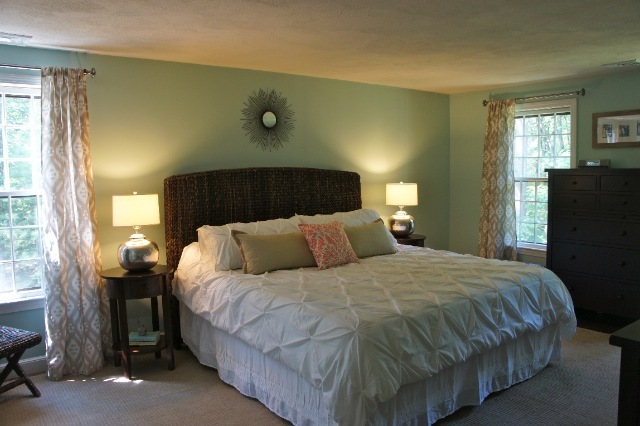 I selected brushed nickel curtain rods to tie in with the lamps. I'm on the lookout for more coral colored accessories so let me know if you find any! I love it!!! It's very inspiring for tackling my apartment! !...but, let's be honest- it would be a lot more fun if I had a house to tackle instead of an apartment. 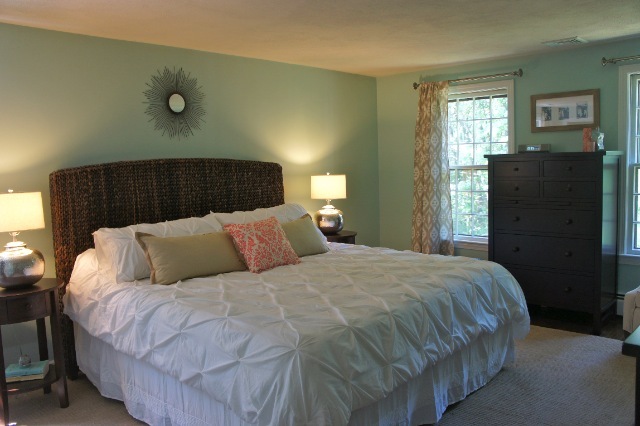 Love what you did with your master bedroom. It looks so peaceful. Love the bedding and your curtains! Love the headboard and the piece of driftwood! It looks great!! gorgeous! loooove the color on the walls! By the way, where did you get your bedspread?? I LOVE it! Thanks! 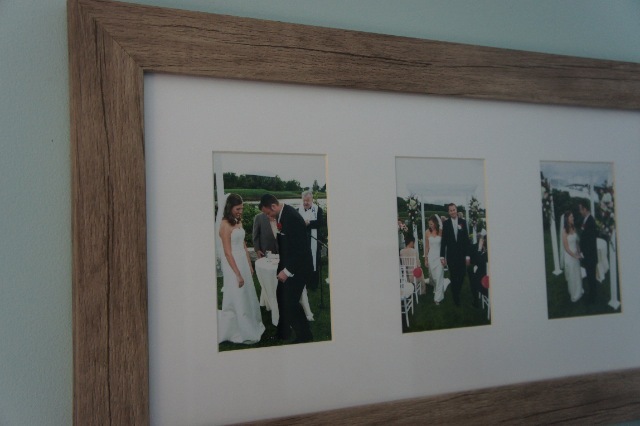 Redecorating is so much fun, but so much work! I've been at it for almost a year and I don't even think I'm halfway done. The bedspread is actually a duvet cover. I bought it at Target, and it's not the best quality (pretty thin) but it wasn't super expensive. It was just important to me that I could throw it in the wash cause the dog loves to sleep on the bed. I've washed it once already and it came out looking great. I think they have the same style at West Elm and Anthropologie. Those might be better quality but I'm not sure what the price difference is. 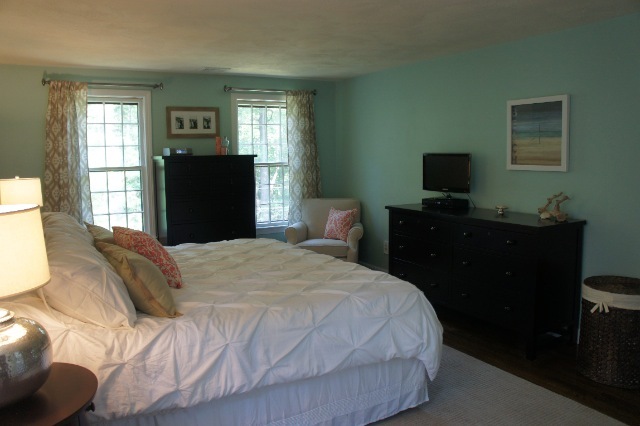 I love the color and the sea grass headboard. 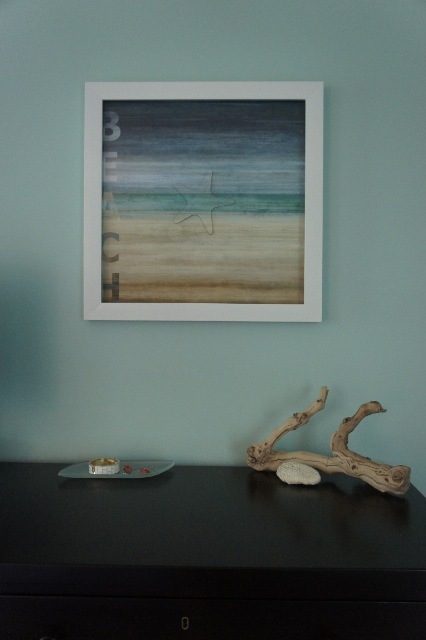 We're going for that relaxing, coastal look, too. Oh, and I hear you on having a washable duvet! We got muddy footprints from our puppies on ours just last night. Thanks Jess! Oh those muddy paw prints! The cuddle time definitely makes up for it! Looking forward to seeing your changes! It's gorgeous!!!!!!!! Those curtains? That lamp??? LOVE IT ALL! Great job!! Hi Jessica! I just stumbled upon your blog and it is so great! 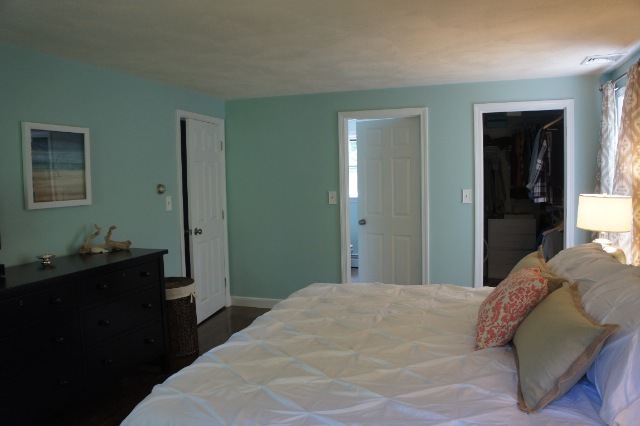 I love your master bedroom makeover - it looks fantastic! :) Looking forward to being a follower! So very lovely!! You did good! ;) Thanks for sharing at Show & Share! I love it Jess! 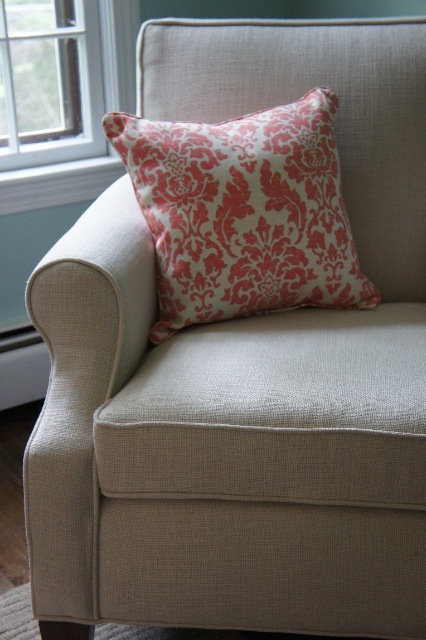 My favorite touches to the room are the curtains, chair and pillows. Can't wait to see it in person - can we BBQ soon?